This one pot rice dish is a staple for fall cooking in my home. Sauté onions and garlic, add in the other ingredients, cover, and let sit for 45 minutes. After that, all that’s left is to eat! The original version of this dish is based on this paella recipe but I’ve morphed it into a stove-top casserole dish as an easy adaptation. Rice and tomatoes cooked together can leave you with al dente rice but the secret is to make sure the rice is well coated with oil before adding the tomatoes. As a side note, our toddler also loves this one pot rice dish (as long as I use a mild curry powder)! This vegetarian one pot rice dish is easy to throw together but is a well-balanced, filling meal. Make sure you use a solid curry powder- it can make or break the dish! In a 3 qt (or 5 qt) dutch oven, heat 2 teaspoons of olive oil over medium heat. Add in the onion and cook until onion is translucent and fragrant, 4 to 5 minutes. Stir in the garlic and cook for another 1 to 2 minutes. Next, add in the remaining 2 teaspoons of olive oil followed by the brown rice. Stir until the rice is well coated with oil. Stir in the squash, chickpeas, curry powder, salt, and pepper. Then add in the tomatoes and vegetable broth. Bring to a boil, reduce to the lowest simmer, cover, and let cook for 45 minutes or until all the water has been absorbed and the rice is tender. Sprinkle with scallions and cilantro before serving. Tips & Tricks: As noted, if the rice isn’t coated with oil, the tomatoes will stop the rice from cooking fully and you will end up with al dente rice. Don’t skip this step. Although cook time of these one pot rice dishes may be long, the hands-off, worry-free meal is an excellent trade off. Additionally, there are a few ways you can easily mix this up if the above written dish isn’t quite to your liking (or if you’re ready to branch out from using curry powder in everything). Sweet Potatoes: Swap out the butternut squash for cubed sweet potato. Spices: If you’re unsure of curry powder, try using a bit more of traditional paella spices: smoked paprika with a bit of turmeric. Quinoa: While you can make a variation using a faster cooking grain, be sure to adjust how you cook the recipe. Steam the butternut squash until almost tender then add to the pot with the quinoa and cook for about 15 minutes or so. The texture will change but this meal would be ready in less than 30 minutes! Brown rice is one of my top five grains. 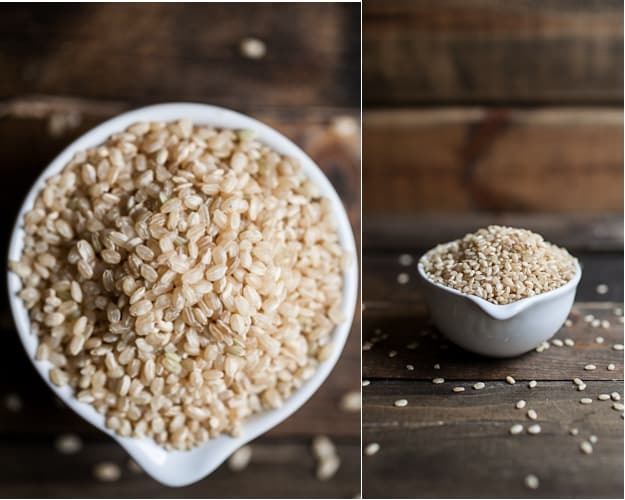 It takes more time to cook than other gluten-free grains but is so versatile. Most of all, I love how it soaks up the flavor of the other ingredients. Just be sure to pick up the right kind! I prefer short grain brown rice but be sure to watch out for sweet brown rice. The end result would be a much stickier rice! This recipe was originally published on November 7th, 2012. Last updated on September 22nd, 2016. Get the original recipe. Sometimes feeling nervous is a good thing… it means you’re pushing yourself and moving forward. 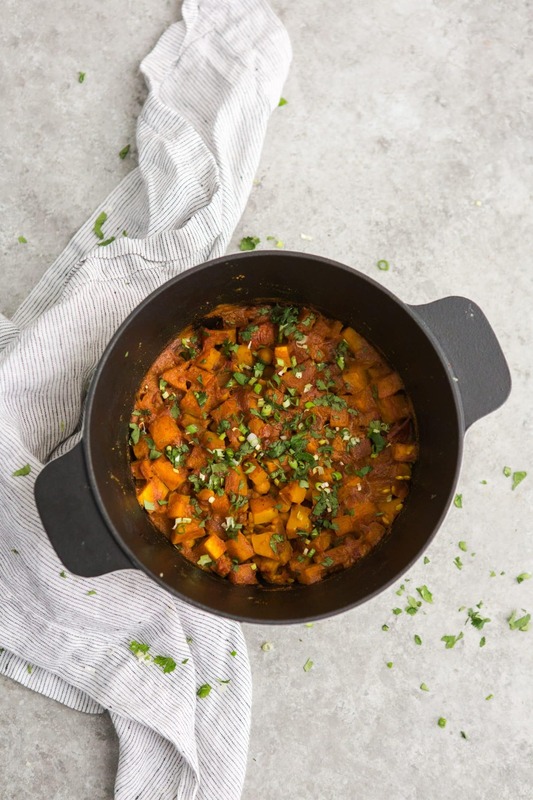 On the other hand, at least you’ve got this awesome curried squash to keep you warm in the meantime! 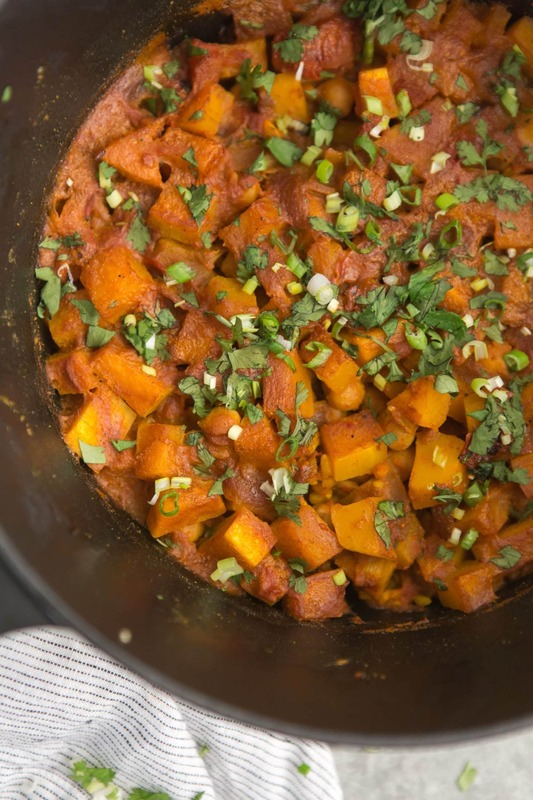 3 of my favorite ingredients – butternut squash, chickpeas, and curry. This sounds delicious! This looks so good for a late night comfort meal! I drive by the Penzey’s headquarters every so often and it smells DIVINE! Love this recipe – I’m always looking for new ideas for my cast iron! (((Hugs))). Do you have a visit planned so you have something to count down to? This sounds absolutely fabulous! Great idea! Six months isn’t too long. 🙂 Maybe it’s not really so important a change, in the grand scheme of things? There will be more. I made this, and it was quite tasty, and, in fact, very comforting. I like the idea of curry-paella hybrid! Ah, distance is hard. Approaching a new phase in life is hard to. But once you get there, it all feels normal again and you’re making newer and better adventures all the time. 6 months of perspective is a pretty amazing gift too. Also, I love skillet/mix-y warm foods in general. This looks so perfect, Erin. This is delicious! Thank you for another simple curry dish! I used cauliflower/sweet potatoes instead of the butternut and it was fantastic. This recipe looks delish! If I don’t have a cast iron skillet can I use a Dutch oven on the stove top? By the time you get this, your 24 hours will be over, and you’ll be fine! I have a feeling…you’re moving towards something good. Meanwhile, speaking of good, I made this dish — like just now — and I am hear to say it is delicious! Experiences like this–as difficult as upheaval and change can be–really show us who we are and what we’re made of. I find change really tough, but how exciting to start anew somewhere and make your life again according to everything you love and want! It can be thrilling. On a more practical note, this dish looks fantastic. It would be an awesome contribution to this month’s Shine Supper Club (our theme is one-pot meals). Looks beautiful ! Wonderful comments! This looks amazing. I’ve been looking for a good recipe to make in my new cast iron skillet and this may be the one. Wondering if the brown rice should be 1/2 cup cooked or uncooked? Thank you! I just made this tonight and my kids loved it! I followed everything pretty closely except used chicken broth instead of vegetable (It’s what I had on hand). During dinner my kids said, “Will there be enough leftovers for lunch tomorrow?” When I told them yes they were elated! Thanks for a great recipe! You know what would make this even more amazing? Roast the cubed squash in the oven first with a little olive oil and salt, then add it to the dish after the rice is done. Do you leave it uncovered while its simmering? i just made this last night and my brown rice stayed al dente…anyway to fix that problem. I think the total cook time was around an hour. 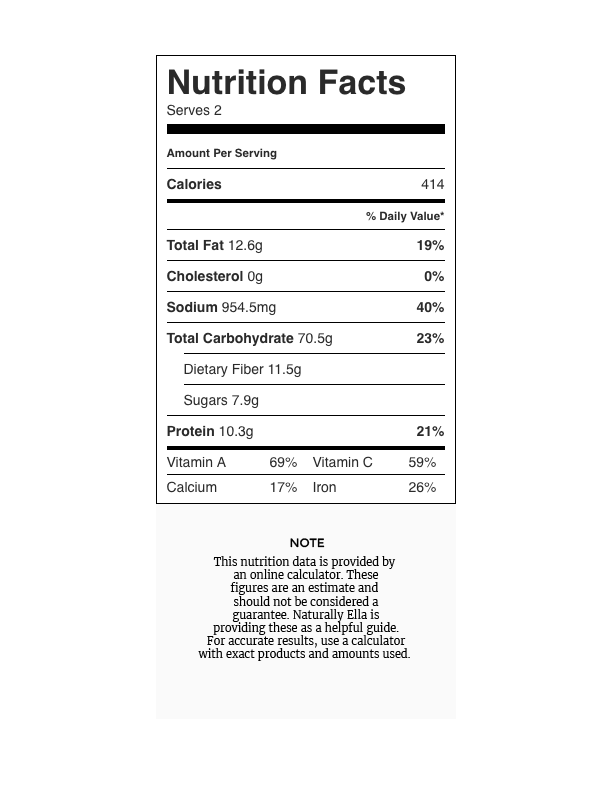 Did you use short-grain brown rice? That’s usually the culprit of not cooking right. Or high heat, but it sounds like you cooked it plenty long. Is the 45 min cook time mainly for the rice? Thinking about subbing with quinoa, which cooks in only 12 min. Thoughts? The 45 minutes is mainly for the rice but also partially for the butternut squash. I think if you cube the squash smaller (or pre cook it some) you could use quinoa for less time. Thank you so much for posting this recipe. I’ve had some leftover roasted squash I’ve been wanting to use and I never thought to put it with curry. I basically made a curry/vegetable/rice dish and added eggplant, roasted red pepper and onions. It was so good and tasted like comfort food yet still healthy. I can’t tell you- I’ve never tried and don’t currently own a crockpot! 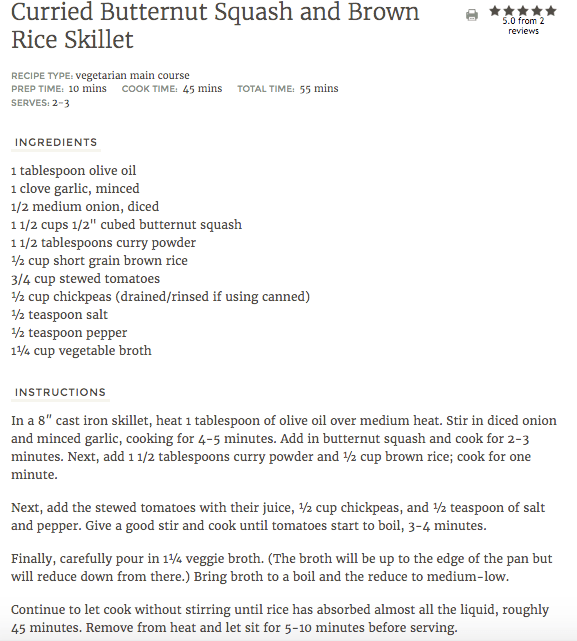 If I were to sub the rice with quinoa, would I need to cook the rest of the ingredients a bit longer, since quinoa pretty much cooks in 15 minutes? As I mentioned above in another comment, I’ve never tried this but I believe yes so the butternut squash is tender and not still raw after the 15 minutes. As for how much time, I really have no idea- I might start with steaming the squash until just about tender and then making the dish. .
Hi Erin! I have been reading your blog for a while now and am in love. Your photos are stunning, your recipes are inspiring, and your genuine good-heartedness comes through on the page. I recently posted a recipe inspired by this recipe and Mark Bittman’s Tomato Paella in the NY Times on my new blog- the link is http://www.nourishing-matters.com/blog/2015/4/3/butternut-squash-and-chickpea-baked-spanish-rice. I had one butternut squash left to use up, so thank you for the inspiration! Keep up the amazing work and I wish continued success and happiness for you and your family. I found this recipe on Pinterest, and made this tonight. I can’t even begin to describe how delicious it was! Thank you so so so much! I’m diabetic, so next time I may add some lentils or something to up the protein… But I adore this dish! My tummy is so stinking happy right now! Endorphins in a bowl! Love the favors in this recipe! The first time I made it, the squash was mushy from cooking for so long. (Personal preference that I prefer it a little bit more firm.) The second time around I just precooked the rice with vegetable stock and mixed it in when the squash was cooked to my liking. Next time I’m going to use one of the suggestions I saw above to roast the squash and mix it in after. That way I can cook the rice with all the other ingredients for more flavor! This may be a basic question but regarding the stewed tomatoes…can it be substituted for crushed tomatoes? Yes, I just use stewed because I like larger pieces of the tomato in the dish! Curious if anyone has substituted sweet potato for butternut squash? Butternut squash isn’t easy to find right now and sweet potatoes are a plenty. 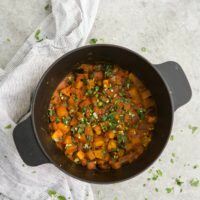 While I’ve never tried it in this recipe- I often use butternut squash and sweet potatoes interchangeably. I think sweet potatoes would work just fine! I love the addition of curry! I have been loving one pot meals lately and this is definitely going to go in the rotation. Looking forward to trying this out on my kiddos! So good! I didn’t have brown rice but it worked great with white rice, just cooked a bit faster. I would just use a whole (small) can of crushed tomatoes like 1.5 cups, and same for chickpeas. Tasted great! Hello, I have a question; how would this dish taste with ras el hanout (maroccan spices) you think? I think it would be delicious! That’s one of my favorite spice blends with squash. Made this several times and it is sooooo yummy! I always make a double batch and eat leftovers for lunch throughout the week. It holds up really well, and even tastes good cold. Definitely recommend adding the scallions and cilantro for a freshness to counter balance the richness of the curry. I also add cashews on top for a salty crunch. As a non-vegitarian I have even sprinkled pieces of bacon on top. (Clearly I’m a fan of toppings, haha.) Plus it’s so easy to make! Will be enjoying this recipe many more times in the future. This was ridiculously good!! I doubled the recipe and didn’t have short grain rice so I used long grain brown rice. Didn’t change anything else. I am so glad I doubled the recipe. Yum yum yum!